ASUS introduced a new ROG Maximus IV Gene-Z/gen 3 motherboard with PCI Express 3.0 slots, you can read all the details at TPU. 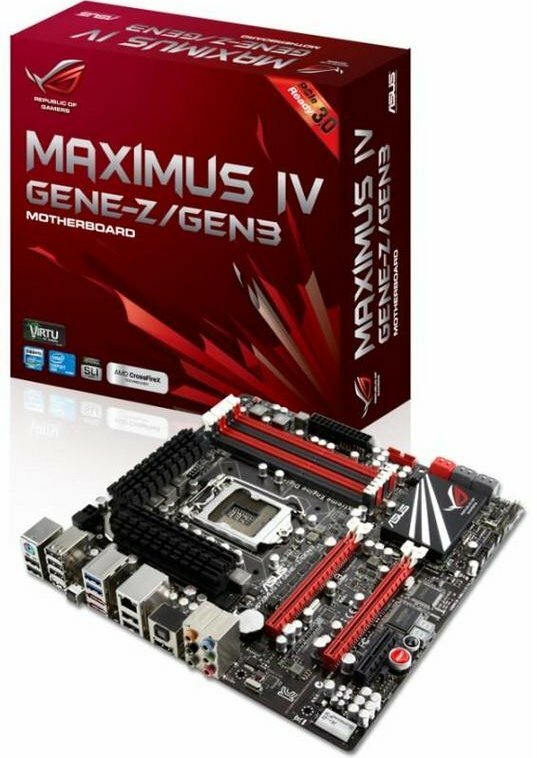 This is the second modification of the Maximus IV Gene, the original was based on Intel P67 chipset, the Gene-Z replaced the chipset with Intel Z68 that supports Smart Response technology, while the Gene-Z/Gen 3 adds PCI-Express 3.0 x16 slots. The board uses a 12-phase Digi+ VRM for the CPU, it is wired to four DDR3 DIMM slots supporting DRAM speeds of up to DDR3-2200 MHz with overclocking. The socket is wired to two PCI-Express 3.0 x16 slots over Gen 3 compliant switches and electrical components, the slots configure to PCI-Express 3.0 x8/x8 when both are populated. PCI-Express Gen 3 support requires next-generation 22 nm Ivy Bridge Core processors, which will be launched next year. The only other expansion slot is an open-ended PCI-Express 2.0 x4, wired to the Z68 PCH. NVIDIA SLI and AMD CrossFire are supported.